Texas embraces a vast collection of sites, objects, districts, buildings and structures recognized for cultural, historic, architectural or archeological significance within its 268,581 square miles. Scratching the surface of the variety of cultural and historic resources reveals Hispanic ranches, maritime vessels, bungalow neighborhoods, prehistoric Indian rock art, midcentury hotels, slave cemeteries, farmsteads, iron truss bridges and urban parks. These are but a few examples of the countless real places that tell the real story of Texas. Scattered across the state of Texas lie the traces of at least 12,000 years of human occupation in an estimated one million archeological sites. Prehistoric sites include ancient bison and mammoth kills in far West Texas and in the High Plains, pictographs and petroglyphs along the canyons of the Lower Pecos and in the El Paso area, earthen mounds constructed by Caddoan Indians in East Texas, mesa-top villages along the Canadian River in the Texas Panhandle and encampments that reflect generations of hunting and gathering subsistence in all regions of the state. 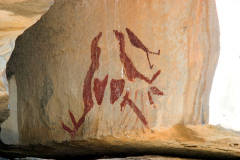 These and other sites contain the only clues available about generations of life in the place that is now encompassed by our state boundaries. Even in the centuries following European contact, written records often contain scant information about past life in Texas. Historic exploration and settlement sites such as La Salle’s Fort St. Louis, Spanish presidios and missions (including the Alamo), shipwrecks, frontier forts, battle sites, simple homesteads and early industrial locales are integral to our understanding of the past. It is important to note that more than 90 percent of archeological sites in Texas are privately owned and many are damaged or lost each year. To date, nearly 3,000 archeological sites, including historic shipwrecks, Native American pictographs and petroglyphs, prehistoric middens, and historic farmsteads and battlefields, are designated as State Archeological Landmarks. This designation applies legal protection to archeological resources in accordance with the Antiquities Code of Texas (Natural Resources Code, Chapter 191). 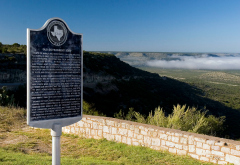 The Historic Texas Lands Plaque program was developed in 2001 to recognize Texas landowners who preserve important archeological sites on their properties. The THC also reviews approximately 6,000 proposed development projects that may affect archeological sites each year and requires approximately 400 archeological surveys annually. 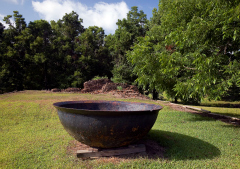 There are more than 300 Texas archeological properties listed in the National Register. Archeological sites are inventoried in the Texas Archeological Sites Atlas, a restricted-user database due to the sensitive nature of archeological sites. 3,000 buildings, districts, sites, structures, and objects listed in the National Register of Historic Places. Of these listings, 350 are historic districts containing more than 30,000 contributing buildings and structures. 15,000 Official Texas Historical Markers that interpret and promote history. 3,600 buildings designated as Recorded Texas Historic Landmarks. 235 historic courthouses that can serve as the focal point of their counties. 22 state historic sites managed by the THC and open to the public. 13 national parks and more than 120 state parks, cultural and historic sites established to protect and interpret the nation’s and state’s history. In addition, thousands of sites are inventoried at the local level, many of which are designated as community landmarks and historic districts. However, countless historic places remain unidentified throughout the state. The Texas landscape has been shaped over time, resulting in a vast collection of properties reflecting its rich and diverse heritage. Historic buildings include the homes of well-known Texas leaders and those of everyday Texans. Some are significant works by famous architects, while others are vernacular designs that reveal the nexus of tradition, function and availability of materials. They include schools that reflect the reality of segregation, entertainment venues that represent the diversity of Texas cultures, and large and small businesses and workplaces that helped shape local, state, and national economies. Significant cultural landscapes include rural districts centered on ranches, farms and agricultural processing facilities, commercial districts and residential neighborhoods in cities and small towns, as well as roadways and other transportation networks, parks, and industrial facilities. Several property types deserve special attention in the area of designations. Commercial properties, especially those clustered in districts, are often eligible for federal tax credits and other incentives, so their designation would help expedite economic development throughout the state. Other places represent the under-told stories of Texas, especially the ethnic and racial diversity of the state. Communities must make it a priority to identify and designate properties that represent all ethnic and religious groups, including Jewish, Tejano, African-American, historic Native American, and Asian peoples. Establishing historic contexts for groups of related properties and nominating them at one time can be an effective way to ensure that important aspects of Texas history are considered. Rare and fragile resources, such as 18th century elements of El Camino real de los Tejas, as well as more recent buildings and structures, such as those associated with Route 66, can be designated through this process. Many facets of Texas history are worthy of comprehensive study through historic context reports. Some contexts are general, and relate to broad concepts of American history, including the significance of colleges and universities, places of worship, ethnic settlements, industry and agriculture, parks and other public facilities, projects of the New Deal, architecture of the postwar period, roads and roadside architecture, entertainment venues such as theaters, and the effects of suburbanization. Other contexts are directly related to things that make Texas distinctive, including dance halls, the works of important Texas architects, and the celebration of the Texas Centennial. Often the scope of general contexts can be limited to specific geographic regions, as in the multiple property submission to the National Register of Historic Places for “Historic Farms and Ranches of Bexar County,” which was initiated by the San Antonio Conservation Society, and serves as an example that can be followed in other parts of the state. Among the most recognized collections of historic buildings are Texas’ 235 historic county courthouses. The state’s courthouses offer superior examples of architectural trends, styles and technological advances in building methods. 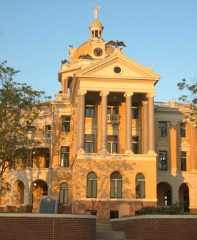 Since 1999, the Texas Historic Courthouse Preservation Program has awarded nearly $251 million in matching grants and assisted 91 county courthouses with preservation work. These courthouses serve as the center point of community pride and their preservation has generated significant economic and social benefits, including more than 10,000 jobs, nearly $239 million in income and more than $325 million in gross state product. With each passing year, thousands of additional properties reach the fifty-year threshold of being old enough to be considered for listing in the National Register of Historic Places. Texas saw tremendous growth after World War II into the 1960s and 70s as industry and population migrated out of the east and mid-west into Sun Belt states in the south and west. Coupled with immigration from Mexico and Latin America, population growth doubled, if not tripled, in most mid-sized to large cities in Texas during this time. Texas cities have an abundance of resources from this postwar building boom that can now be evaluated for their historic significance. The Texas economy outpaced the national economy in recovery from the Great Recession, which officially lasted from December 2007 to June 2009, and the state continues to demonstrate strong performance in job growth, sales tax collection, and housing sales. Pre-recession Texas employment peaked in August 2008 at 10,638,100. This number was surpassed in November 2011 while the US job market did not recover all recession-hit jobs until May 2014. The strong state economy also reflects a steadily increasing population, with the recession having little impact on population data. Demographic projections show a state growing, diversifying, and aging substantially in the coming decades, and Texas is expected to remain among the fastest-growing states in the nation. The U.S. Census confirmed 25,145,561 people living in Texas in 2010, a 20 percent increase from 2000. The Census estimated the state population as 26,448,193 in 2013. This steady population growth is expected to continue, due largely in part to migration, with numbers exceeding 30 million by 2019. Significant to this growth is the change in demographics. Hispanics are projected to be the majority by 2017. By 2040, it is projected that at least 60 percent of residents will be non-Anglo and the average resident will be over the age of 50. Demographic changes will be accompanied by trends in land development. As the population of Texas continues to increase, so will development in metropolitan regions as well as in unincorporated areas surrounding urban areas. In 2000, approximately 86 percent of the Texas population lived in metropolitan areas. By 2020, 87.7 percent of the population is projected to live in metropolitan areas. Eight of the fifteen fastest growing large U.S. cities are in Texas with Houston, San Antonio, Austin, Dallas and Fort Worth attracting the largest numbers of people in 2013. Historic preservation programs across the state are directly tied to the economy and are impacted by changes in population, income, employment, and increased local tax revenue. While a strong economy is good for preservation as whole, it also means an increased demand for programs and services. Private property owners are more likely to reinvest in historic buildings; therefore, more design services, financing tools, and funding sources are needed. Economic development programs and historic preservation-based tax incentive programs also experience higher participation levels when the economy is stable. As the state’s population continues to trend towards major cities, areas containing previously undisturbed archeological and historic resources are targeted for growth and new development, which increases the demand for regulatory reviews and may mobilize local advocacy groups depending on the resource at risk. This population migration also results in intense pressure on low-density historic resources. These demographic trends often have the reverse impact on rural communities. The state’s more rural areas suffer both population and economic decline as people migrate to urban centers. Access to heritage tourism and downtown revitalization resources, as well as advocacy training and grant funding, is essential for these communities.